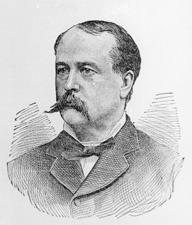 SEWELL, William Joyce, a Senator from New Jersey; born in Castlebar, Ireland, December 6, 1835; immigrated to the United States in 1851; engaged in mercantile pursuits in Chicago, Ill.; moved to Camden, N.J., in 1860; during the Civil War, served with the New Jersey Volunteers, beginning as a captain in 1861; brevetted brigadier general and major general in 1865; awarded the Congressional Medal of Honor in 1896, for having assumed command of a brigade at Chancellorsville, Va., May 3, 1863; after the war became connected with railroads in New Jersey; member, State senate 1872-1881, serving as president in 1876, 1879-1880; elected as a Republican to the United States Senate and served from March 4, 1881, to March 3, 1887; unsuccessful candidate for reelection in 1887, and for election to the United States Senate in 1889 and 1893; chairman, Committee on Enrolled Bills (Forty-seventh and Forty-eighth Congresses), Committee on Military Affairs (Forty-ninth Congress), Committee on the Library (Forty-ninth Congress); one of the national commissioners for New Jersey to the Worlds Columbian Exposition in Chicago in 1893; was in command of the Second Brigade of the National Guard of New Jersey; appointed a member of the Board of Managers of the National Home for Disabled Volunteer Soldiers; again elected to the United States Senate in 1895; reelected in 1901 and served from March 4, 1895, until his death in Camden, N.J., December 27, 1901; chairman, Committee on Enrolled Bills (Fifty-fourth through Fifty-seventh Congresses); interment in Harleigh Cemetery. Dictionary of American Biography; U.S. Congress. Memorial Addresses. 57th Cong., 2nd sess., 1902-1903. Washington, D.C.: Government Printing Office, 1903.